There are a little over 51,400 insulation workers throughout the nation, and most of them have only a high school degree or GED. Insulation workers are the workers that either install or replace insulating materials throughout offices, residential locations and other buildings. Workers that are skilled in insulation will be able to install many types of insulation, including sheets of insulating materials as well as loose fill materials. Some types of insulation can be difficult to install or even hazardous, which means insulation workers need to be extremely skilled. There are two main varieties of insulation worker: those that use raw materials to insulate buildings and those that use complex mechanical systems to insulate buildings. 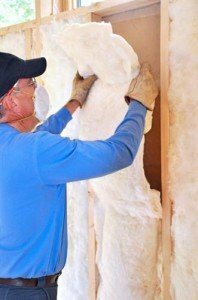 These two differences comprise different career paths that a person interested in insulation can take. What Does an Insulation Worker Do? Insulation is a very simple industry: it is the industry of maintaining the temperature of a building. However, insulation itself is not simple. There are a variety of complex ways that the internal system of a building can be kept at the level that is desired. New energy-efficient materials and machinery have increased the necessity of insulation workers, as has a push towards more energy-efficient building standards in general. An insulation worker will usually be the person who physically installs, repairs and maintains insulation materials as well as insulation machinery. Most insulation workers will work with a larger company and will work under the direction of another person. This means that many of them will not need to read blueprints or have other advanced skills. Those that work with machinery, however, may require a little more specialized knowledge. Workers that install insulation may need to squeeze into small spaces, and they will need to be strong. They should also be aware that the job does carry with it some health hazards, and it can be very physically demanding. How Can You Become an Insulation Worker? Those that wish to install wall, ceiling or floor installation in homes such as batting or loose fill materials can simply learn the techniques on the job. To get into this field all one has to do is get hired by the appropriate company and then learn as they go. However, according to the Bureau of Labor Statistics, those that are interested in mechanical insulation will usually need to go through an apprenticeship before being allowed to work on their own. These apprenticeships are usually paid and are normally brief. There are certifications that insulation workers can acquire to prove that they have the skills necessary to install and repair insulation within buildings. Having this certification can be useful in gaining employment in the industry, and some companies may require this certification upon or after hiring to ensure that the worker knows the basics of the insulation industry. How Do You Advance as an Insulation Worker? As noted in the Occupational Outlook Handbook, the job outlook is quite good for those going into this field. In part, this is due to the fact that many skilled insulation workers will move on to other positions. Insulation workers can become supervisors for other workers or set up their own companies. They can also become insulation contract estimators. Many insulation installers tend to move into these positions as they get older because insulation is a physically demanding job.